We take our Original Goat's Milk Soap, grate it up and add Farm Fresh Goat's Milk and more moisturizing oils to make an extraordinarily nourishing soap. Excellent as a facial cleanser, our Hand Milled Soap is also soothing to extremely dry skin either as a hand soap or in the shower. Super Soap was developed for problem acne and contains 5 Essential Oils know to be beneficial for soothing this skin issue, plus oatmeal for gentle exfoliation. The exfoliating properties of real PEI sand combined with the scent of Island berries make our PEI Sand Bar a delight! Keep the memories of summer close whenever you use this moisturizing soap. Gentle, soothing ground Oats and the comforting scent of Vanilla soften and ease sensitive skin. This Coconut soap was made by popular demand and is a consistent favourite. Oh so coconutty! Completely unscented and utterly fabulous! This facial bar is luxuriously moisturizing and soothing, excellent for sensitive skin. This facial bar is luxuriously moisturizing and soothing, excellent for sensitive skin. Wonderfully soothing on many levels. Oatmeal relieves dry skin and gently exfoliates, while the Cocoa does for the rest of your senses what any good piece of chocolate will! Lavender is a classic scent and is excellent for soothing dry skin. For more than a decade we have only sold soap that we made ourselves here at The Great Canadian Soap Co. in Prince Edward Island. In October 2013 we travelled to Africa on our soap mission. Since then, we learned about a traditional soap made in Africa that is well known around the world as 'African black soap'. This past summer we sourced a small amount of African black soap imported from a Fair Trade Village in Africa that supports both woman and children. The soap comes to us wrapped in cloth and is about the size of a large football or rugby ball. We then grate the soap and melt it over low heat before pouring it into molds. We hope you will consider trying this soap and help us to continue our support. The website Mother Nature Network has an article explaining how this unique soap is made and some of the benefits. Packaging: Because the soap is so soft, labels will not stick to it. This product comes in a small brown bag (like a candy bag) with a label on it explaining the directions and ingredients. How To Use: You can cut the muffin in half or quarters with a kitchen knife. To use it, simply take a piece of soap and mix it with water in your hand or on a washcloth and bathe as desired. 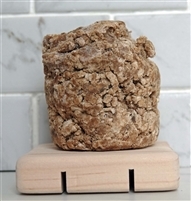 African black soap lathers extremely well, so a small amount lasts a very long time. This product is for use on both body and hair.